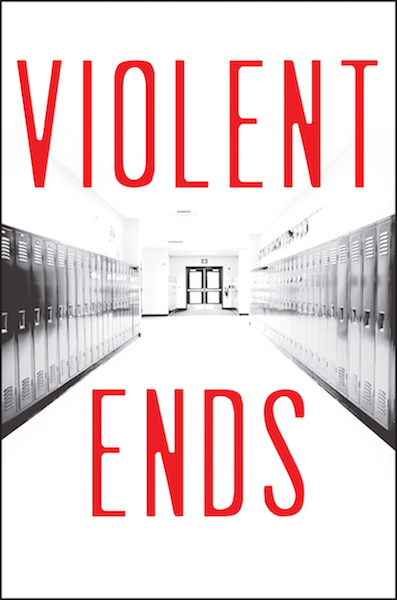 Violent Ends by Shaun David Hutchinson and 17 contributors tells the story of a fictional school shooting from multiple perspectives. The front cover of the book, Violent Ends by Shaun David Hutchinson and 17 more. Since Columbine in 1998, school shootings have been taking a toll on American society. Violent Ends by Shaun David Hutchinson and 17 additional contributing authors is a book about a traumatic school shooting taking place at fictional Middleborough High. Hutchinson and the others took a unique approach to this intricate and detailed story about a tough, but necessary, topic. The point of this story is not to describe the details of the tragic event that fictitiously took place. Instead, its purpose is to give insight about individuals in the school community: those who are suffering, those who make the killer suffer, and those who make him happy. 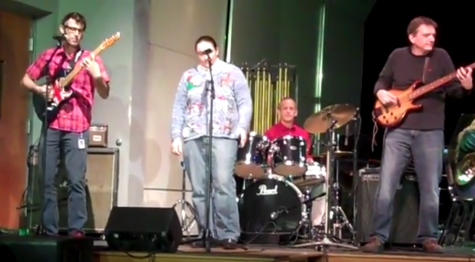 The time-skipping pattern, although hard to follow, gives the audience an understanding of what made Kirby Matheson decide one day to walk into school with a “nine-millimeter Glock ninteen” and shoot 12 people in total. 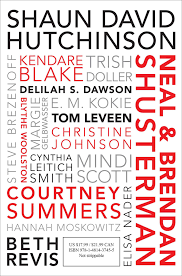 The back cover of the book, showing every authors name who wrote a chapter in the book. excluding Neal and Brendan Shusterman who worked together on the same character. Characters have their own chapter, some of which are broken down into sections. Violent Ends’ rare choice in narration develops different feelings for readers towards the “stars” of the novel. Kirby saves several of his friends from the shooting in very discreet ways, evoking the feelings of pity, sympathy, and empathy for a character whose main goal was to harm others. This narrator is not a human source of insight into Kirby’s motivations. Instead, this narrator is more personal, an object that was with Kirby throughout some of his hardest times. The narrator is the gun used by Kirby Matheson to shoot the eleven students and teachers as well as himself. Although there is no chapter from Kirby’s perspective, this chapter by far gives the most personal and vulnerable experiences that led Kirby to murder and suicide. “Presumed Destroyed,” written by Neal and Brendan Shusterman, shows a pitiful and distressed side of Kirby. The gun sees the pain Kirby has within him, and in a silent wish, begs him to not kill himself. Some characters sharing their piece of the story have disturbing and hard to read chapters. Books with emotionally disturbing chapters often have scenes or topics that can trigger some individuals who have experienced trauma. But it may also cause discomfort to readers who have never experienced these harsh topics personally. Hutchinson and the contributing authors do not give a trigger warning in the book; however, on Hutchinson’s official website, the book is described with a list of trigger warnings included. The following list is the trigger warnings connected to the story. The inclusion of these different, hard-to-talk-about topics helps to develop the uniqueness of this book. The book’s individuality and lack of perfect characters or resolutions helps the reader to relate on a more personal level. Connecting with a character on more than just similar interests allows for more of an intense understanding with the book. Violent Ends is a book with a not-so-happy ending, allowing for a sense of reality to slip in and hit home with the reader. Taking on this captivating novel gives the reader the ability to take on different perspectives in every aspect of life. It shows the importance of reading into people before jumping to conclusions and assuming the worst, and potentially untrue rumors, about a person or situation.